Hotels are no longer solely for a good night’s sleep. In addition, they have perfected their mattresses, sheet sets, décor and more to such an extent that guestrooms are now something of a shopper’s showroom. At a variety of hotels worldwide, guests can now purchase items they fall in love with at their home away from home and then take them back to their permanent home. You can buy your favourite hotel products from the following webstores. Almost all of Starwood’s brands have introduced online stores for guests who repeatedly ask where they bought their sheets, or even where to find their decorative artwork. It is important to note that, while the brand does ship internationally, all international duties and customs are the customer’s responsibility and are not included in the shipping costs. The St. Regis brand has made a few signature items available online, including the exclusive Grand Tourista Bag by Jason Wu and the Bloody Mary Book, which is coming soon and features famed bartender Fernand Petiot’s Bloody Mary recipe. Guests who have had great experiences with the St. Regis Bed, linens or bath products can also purchase these items online. The Westin Hotels and Resorts was the first hotel to brand its bed in 1999. A short while later guests started to ask where they could purchase the Heavenly Bed. 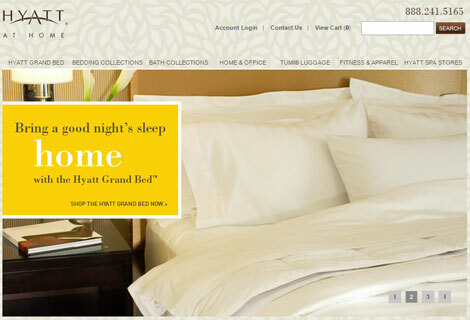 Westin responded by introducing a phone hotline and retail website and, in 2005, was the first chain hotel to bring its bed and bedding to a retail store (Nordstrom). In addition to selling their bedding individually and in sets, the Westin Store offers home fragrance diffusers, sprays, bath and body productsm and more. There is even a Heavenly Dog Bed available so your pooch can have an equally satisfying night’s rest. While Premier Inn does not have an entire online shop, it does provide guests with the opportunity to buy their mattress. The Premier Inn Bed is sold by Hypnosbeds. More information can be found at premierinn.com. Although Four Seasons does not have an online store either, the three Four Seasons Mattress Toppers are available to buy. Over the next few years these new beds will replace the old in all Four Seasons properties (the new toppers are currently only fitted in the US). Guests can purchase the mattress of their choice directly from a hotel or resort. So, the next time you simply can’t resist the cosy hotel slippers or the chic tea set from the hotel cafe, perhaps one of these links can help you take them home. Let us know if we’ve missed any shops or if you’ve found your favourite hotel comforts elsewhere.